Life is a glorious journey. Just like a great book, We look forward to each new chapter. "Proven Products for Horse and Rider"
All products come with a 30-day money back guaranty. Because if you are not happy with it you should not own it. Hardware / Silver & Rigging, Camping and trailer/RV supplies as well as, SPECIALS: Fencing, Bags, Bits, Horse boots, Ranch Cart, Grooming, Books, Clothing and Brenderup horse trailer information. Pack Saddle - packing information. Stirrups and Safety: Stirrups and Toe Stoppers - to prevent riding dragging. Videos: - Of featured products. DISCLAIMER: The photos used on this website are of our horses, all whom have been imprinted and desensitized from birth. We are professionals; do not try to duplicate any of the stunts shown without properly training your horse and using the proper safety equipment such as helmets, vests, stirrups and foot ware. The purpose of this website is to further educate and entertain. The producer Cathy Sheets Tauer and Hill View Farms ® LLC disclaim responsibility or liability directly or indirectly in regard to any loss or damage incurred as the result of this information contained in this website. HILL VIEW FARMS ® LLC is devoted to putting the Horse First and providing the best service possible. As a family business, they have complete control and thus able to give customers the individual and personalized service they feel is so important. Cathy Sheets Tauer has been involved with horses since 1965 and the family has been riding Delrin system saddles since 1994. In 1996 they decided to share their knowledge and experiences with others by providing products that they themselves use and have thoroughly tested for at least one year. Cathy has a B.S. degree with honors in Animal Science (1982), ESMT Certification (Equine Sports Massage Therapy) from Equissage™, and a life time member of the International Association of Equine Massage Sports Therapists. She worked in corporate sales and marketing for over a decade, and has ridden and trained horses all of her life. Cathy was schooled abroad and at home in hunt seat, equitation, dressage, western, and English pleasure, and saddle-seat style of riding; she has gamed and along with her family, has participated in endurance and competitive riding. Don and Cathy Tauer have raised three girls and over a dozen horses out on the trail, horse camping. Cathy's season starts April and continues on through November. (Where Cathy has been). The Tauer family has owned, ridden, trained and bred both gaited and non-gaited horses and have loved each and every one. It is this passion, along with Cathy’s quest for perfection, that led to the development of countless products specifically designed for the horse and rider. To date there is no one person who comes close to the miles ridden using the various types of panel system saddles or who has sold and fit as many panel saddles as Cathy. Who else better to know what does and does not work? Because of this wealth of experience, Hill View Farms ® and Tauer Manufacturing has produced its own line of specialized saddles and tack. So advanced and perfect is this system that Hill View Farms® offers an unconditional 30-day money back - customer and horse satisfaction guarantee. So whatever the discipline, every Evolutionary Saddle ™ is specially equipped with the Delrin® System X flexible panel. This orthopedic flexible panel has revolutionized saddlery as we know it by bending and flexing with the horse allowing true freedom of movement. Besides the saddles, Hill View Farms ® carry an array of accessories - all unique and not easily found elsewhere. All products are field tested with 1000 miles of annual riding / horse camping. The next chapter: From Cathy, The crash August 15, 2015 changed my life, as it did others. I now know that I will die with my eyes wide open, for in less than a blink of an eye, everything once known has changed. This includes relationships with friends and family. I am now LIVEing, LOVEing and LAUGHing my way through the rest of my life. It is true, I am not riding like I use to, but with my new world around me, I welcome you all out for a Once in a life time, Black Hills Experience. Come with or without horses to Tauering Pines. Tauering Pines - Vacation in the Black Hills, SD Facebook page is: https://m.facebook.com/profile.php?id=998404450259312&ref=content_filter Share stories, adventures, dreams and wisdom. Leave fulfilled and content. Life is Beautiful. Live, love and laugh. Hill View Farms would be delighted to serve you and the needs of your horse. Just call with any questions or to schedule an appointment. On our web site, you will find information and products to enjoy and share with others. Hill View Farms ®, is dedicated in making a difference within the equine industry as it is, for the love of the horse. The Journey of our business.
" Helping One Customer At A Time"
About: Hill View Farms, has been recognized and featured in print, radio and on T.V:. October 2010 Bill Porter Wildlife TV show, November 2009 Bill Porter Wildlife TV show mini videos of trip, January 2009 Horse Digest, July 2008 All things Equine on Public Radio for northern MN (KAXE-FM): .July 2008 Easy Care Dealer of the month. March 2008 Springfield Advance-Press, June/July 2006 Women inc. magazine; May 2005 The Barrel Horse News Magazine; 12/04 and 03/04 Horse'n Around Equine monthly news publication MN; 04/04 Tack'nTogs trade magazine; 01/04 Paso Fino Horse World Magazine; 7/03 The Country Today Newspaper WI; 3/03 Tack'nTogs Magazine; 1/03 Tack'nTogs magazine; 4/03 Trail Blazer Magazine; 9/02 KCCO Twin Cities-Radio; 9/02 MN-DNR State Report; 6/00 Springfield Advance Press Newspaper; 1999 The Agri News-Magazine; 1999 KNUJ -94.7-Radio; 1998 KEYC-TV Mankato, MN; 1998 Redwood Gazette Newspaper MN; 1998 Mankato Free Press Newspaper MN; 1998 The New Ulm Journal Newspaper MN; 1998 The Independent-Marshall Newspaper MN; 1988 The Rick Lamb-Radio Show-national broadcast). Customer question: Why do you not have complete on-line shopping? As a consumer myself, I know that there are fewer mistakes, returns and/or less dissatisfaction when dealing directly with the consumer. This is why we have a TOLL FREE phone and fax number for you to use. We both can ask questions of each other and get your order exactly right. When you call us you will get us directly. If for some reason we are out of the office, we will tell you by machine and will return your call upon our return. We are available for the most part 7 days a week, 24 hours a day and we are always happy to receive your call. There is no bad time to call. This is our job and we do it for you, because we are consumers just like you! However, we are able to receive payment online. The shipping will need to be calculated by you and manually put in. YOU MUST call or email for pricing quotes. If you do not have the correct shipping, your order may be delayed. I will continue to review my on line payment programs, but for now this is the best it is going to get. 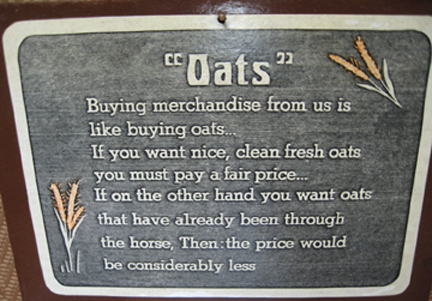 Q: Why are your products higher priced than what I can get in the commercial stores/ or on line? Items that Cathy personally sews / makes, as well as, custom design work for all aspects of personal living and recreational endeavors. Garment bag, Segway covers, custom clothing of all types, bed spreads, curtains, chair covers, upholstering, barn and home design, Marco-weavings, Duffel picket line bag, Hip bags, Saddle Dust cover, Seat Cushion, Kangaroo feed bag, Boot warmers, Polar fleece cap, Deluxe fleece cap, Blocking, Converter for western to English, Easy girth converter, Neoprene girth, Leather contoured girth, Rear flank cinch, Cinch ring cover, Britching, Neo crupper, Two strap neo crupper, English billets, Slip on fenders, Fenders, Hoof pick / knife holder, Western off billet, Western latigo, Pail holder, Picket lead/cross tie, Wrist swap, Tree hugger, Easy bridle, Halter bridle, Riding swap, Rope halter, Ride and tie, Loop reins, Split reins, Saddle soxs - all kinds, Saddle pad, Corrective saddle pad, Saddle shims, Reflective wraps, Biothane leathers, Leather covered stirrups, English leathers, Stirrups pads, Easy tapadaros, Seat shrinker, Ware flaps, Encasements, Rigging, Rear billets, English hanger bars. AND NOW you know WHY I have to stop selling other stuff - that is found on line that I do not make. I am just TOO BUSY. "We will continue to search out, find and carry only those products from manufactures who provide the quality and service that we ourselves expect." For more on holding manufacturers accountable. Click here. As a contract manufacturer, we require goods built to our specifications. This product will carry the HVF Brand - exclusively, with no other manufacturer mark. This Branded Product in itself will carry a 2-year warrantee against defects, natural wear and tear, but not customer abuse or neglect. SIDE NOTE FROM CATHY TAUER: I have been told by many business persons and dimensional profilers that I look at life through rose colored glasses, and for running a business this is not a desirable quality. Well I completely disagree! To help me understand the way I live my life and conduct business, my dear, dear friend Sharon sent me this, Click here, which I'm sharing with you. This is the reason that our family continues to flourish - it is because we sincerely care about those we help, it is because of this passion that we look at life differently than most. Profit in our business is seen as the benefit of helping people, not the reason to. What we have learned about business is: Companies that produce quality products, support home grown industries, market fairly, provide superior customer service and have strong product knowledge - from start to finish, will succeed!